Country house, 2 bedrooms, kitchen/dining room, living room, bathroom. Would you like to spend a wonderful week in complete relaxation in the picturesque countryside of Tuscany? Our accomodation is what you are looking for. Located in one of the most beautiful tuscan landscapes, it is an enchantingly renovated country house set on the hillside near the little town of Palaia (Pisa), in a country property of nearly 10 acres, with fabulous views over a marvellous natural fresco where flowers, olives and vineyards are some of the main subjects. It is ideal for families with children or small groups of friends up to 5 people plus one baby. 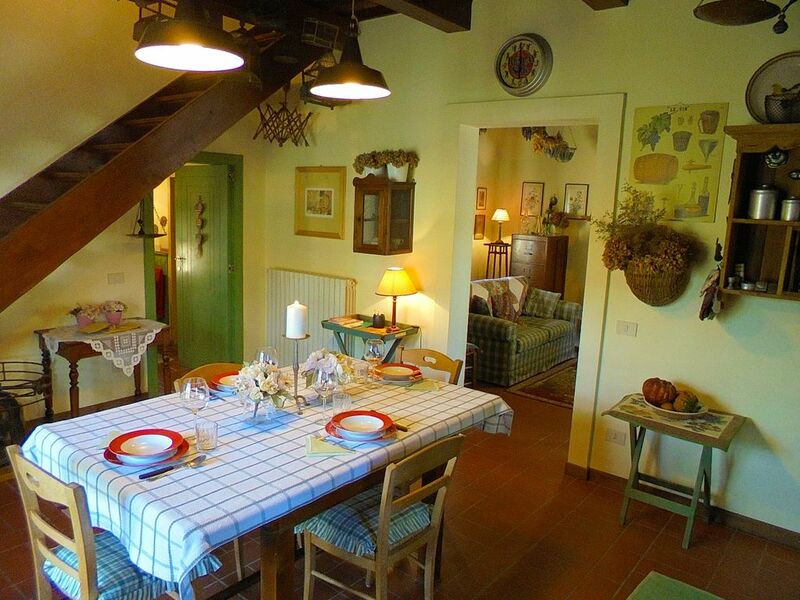 The accommodation is completely furnished in a rustic way, with traditional floors and nice wooden beam-ceilings. On the ground floor you can find the kitchen/dining room complete with oven, big wooden dining table, a large hob, freezer and fridge. The sitting room, where you can relax by the fire on two comfortable sofas and listen to some good music, is carefully furnished and communicates with the dining room. The bathroom is also on the ground floor and has a roomy shower, basin, w.c. and bidet. Upstairs there are two bedrooms, each one with one double bed (or 2 single beds), excellent wardrobe and TV. One additional single bed is also available on request. Every little detail has been chosen with much care and interest. In the garden you can do the barbeque and enjoy a special meal under the beautiful pergola or just sunbathe on the lounge chairs in the company of a refreshing aperitif! From our property guests may reach every interesting historical city or important seaside resorts in more or less one hour. The estate, completely isolated from noise and pollution of towns, is ideal for those who look for relax and privacy. The house is equipped with all the modern facilities to make your stay as pleasant and easy as possible. There is nothing more to say; now it is time to see our house with your own eyes! Matteo provided a warm welcome. Welcome pack was a pleasant surprise. Loved the house and the location and will definitely be back! Perfect house ..... Perfect location. The house is in a beautiful location, very peaceful and perfectly situated for visiting all that Tuscany has to offer, or just relaxing, the terrace has absolutely stunning views. The interior of the house is full of character and is equipped with everything you could need, our father and son hosts were very friendly and most helpful. The local area is charming with plentiful shops and different places to eat. Overall a great place to stay, we had a great time, and would recommend a stay at this property to anyone. Superbly located for peace and relaxation yet within easy distance of major cities and all the local sights. The views from the terrace are stunning. Parking is on site and secure. Matteo and Fabio are very accommodating and helpful and speak very good English. The welcome pack was a lovely touch and much appreciated. Suitable property for good or bad weather as it is spacious and well equipped inside and out. All in all a great experience and would recommend. Really enjoyed our stay in Tuscany,The property was lovely,very comfortable and surrounded by the beautiful Tuscan countryside. Wonderful house in lovely setting. I am doing my impression of the property as I type. She says its great but a bit too visual for a written review. Of course if I was a critic for a holiday company then a far more lyrical description would be forthcoming. But I deliver cars so it won't. Its a good house in a nice place. Matteo is a nice chap and the sun shone. Nights were dark as they should be. I found a porcupine quill in the garden but did not see the critter. Seeing it would have been the only way to improve on our stay here. I may book again and bring some night goggles. This place does what it says on the tin. Really quiet and relaxing. The wine and food were simple and superb. We normally do not drink much but on our return will be attending AA group to discuss our Chianti withdrawl. Anyhow stay hete bevause I said so and I think you would love it too. Can I go now? Tim aged 52. We had a fantastic time thanks to our host Matteo and his beautiful beautiful place! We had a great time in Tuscany and enjoyed the quit and far out holiday home! As we stayed there in November we where very happy about the central heating which was quite necessary during some days. Our host Matteo is very friendly and helpful and he makes shure that things run smoothly! The home was equipped very well for our little family and electricity, water and heating was included which was fantastic too! We had a wonderful time in beautiful Tuscany and wish we will be lucky enough to enjoy Matteos holiday home in the near future when it gets warmer again! Thank you so much, Matteo and best Regards to your father too! Palaia is a very small village which has a gorgeous country around.It is definetly a good base to visit the beauties of Tuscany, living at the same time to relax of an uncontaminated environment.Only 15 mins by car and you are in Pontedera,small city but with lots of nice bars,pubs and restaurant as well as a lot of activities such as tennis, swimming pools,football and so on. If you want to visit the Dome,the Uffizi or Ponte Vecchio in Florence (the cradle of Renaissance) you can go either by car (1h20) or by train from Pontedera (50mins). One day you could go to Pisa and lay in the sun on the grass of Piazza dei Miracoli with the famous Leaning Tower in front of you (50 mins by car or 15 mins with the train from Pontedera). You cannot miss Siena with his marvellous Piazza del Campo which in August changes in a Horse race for the Palio. Moreover the location is well related with famous wine itineraries and it is for example very nice to drive along the road to San Gimignano, which passes through hills and valleys,and along which many farms produce and sell their own olive oil and wine for competitive prices. Lucca and Viareggio are also easily reachable. We will be very happy to give information’s about place where to go and good restaurants!